Michael Grandage Company and Headlong presented the world première of James Graham’s new play Labour of Love, starring Martin Freeman and Tamsin Greig in 2017. Labour of Love Theatre Breaks are no longer available. 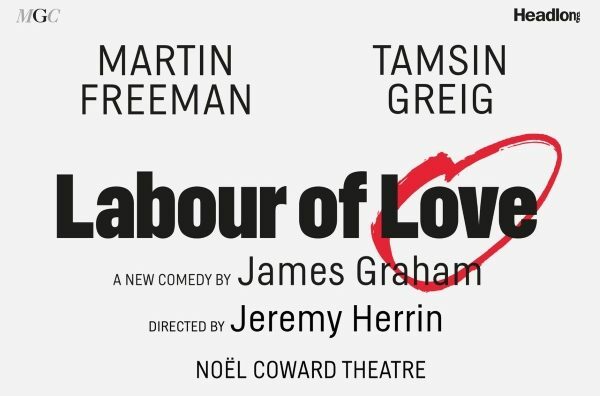 Michael Grandage Company and Headlong presented the world première of James Graham’s new play Labour of Love, starring Martin Freeman and Tamsin Greig at the Noel Coward Theatre in September 2017. This razor-sharp political comedy reunited James Graham and director Jeremy Herrin following their previous collaboration on This House, and played at the Noël Coward Theatre from the 15 September for 10 weeks only. This Party isn’t over. Its just getting started! Labour MP David Lyons cares about modernisation and “electability”… his constituency agent, Jean Whittaker cares about principles and her community. Set away from the Westminster bubble in the party’s traditional northern heartlands, this is a clash of philosophy, culture and class against the backdrop of the Labour Party over 25 years as it moves from Kinnock through Blair into Corbyn… and beyond? Labour of Love saw the return of MGC to the West End following Photograph 51 starring Nicole Kidman and their acclaimed 2013/14 season, also at the Noël Coward Theatre. Top Ten Theatre Breaks Goodbyes!